The economy is still in decline but results from a new economic survey show evidence the recession is abating as more companies see rising demand for their products, taper plans for job cuts and report profit margins on the uptick. The latest quarterly survey by the National Association for Business Economics, set to be released Monday, indicates that the economy is at an inflection point, but not quite a turning point, said Sara Johnson, NABE’s lead analyst on the survey and an economist at IHS Global Insight. Still, the NABE survey of companies and trade associations showed that pessimism about U.S. economic growth is rising, as 93 percent of respondents expected real GDP to decline this year. That was worse than 78 percent in the previous survey in January. Employment prospects are still down, too, and wages are at their lowest point since the survey began 27 years ago. The number of companies reporting lower employment totaled 39 percent, down from 44 percent. Goods-producing industries fared the worst, with 83 percent reporting job losses, and none reporting growth. The outlook for jobs remains grim, with losses expected to continue in the next six months. Only 16 percent of companies predicted an increase in hiring at their firms, slightly worse than the 17 percent in January. But the number of companies predicting job losses improved to 33 percent from 39 percent. The straight talk translation: The ship is still sinking, just not as fast. Stocks rose on Friday, with the Dow scoring its biggest six-week gain since July 1938, helped by a reassuring report on the mood of consumers and stabilization in General Electric (GE.N) and Citigroup’s (C.N) quarterly results. The Dow is up 22.7 percent over the past six weeks, making this the largest six-week gain since July 29, 1938. As famed commentator Paul Harvey would have said, “and now for the rest of the story”. The year 1938 was a year during the “Great Depression”. 1938 did not signal the end of the “Great Depression”. The “Great Depression” lasted ” 4 more years” after 1938, not ending until 1942. How did the ”stock market” fare during the Great Depression? In 6 of the 11+ years of the Great Depression the “Stock Market” closed up despite the fact that unemployment continued to rise, home foreclosures hit all time highs and thousands of businesses and farms were lost. This writer is hoping an economic recovery is underway, however, that is not what the data suggests. As you can see, the DJIA, does not necessarily reflect the direction of economic activity – the DJIA can register gains while the “economy” slips futher into a “Great Depression” or, in other words, Government bailout programs can make the politically connected extremely rich while the Country, as a whole, slips below water. April 2009 unemployment continues to climb at 600,000 + per week. Unemployment, with the addition of the newly unemployed in April 2009, is now above 9%, nearly one full percentage point above the Obama Administration’s “worse case estimate” for a “maximum unemployment figure” of 8.1% in 2009. Economists are now examining whether unemployment will top 11% before year end, 40% higher than the Administration’s forecast. http://www.bls.gov/news.release/pdf/empsit.pdf Between January of 2004 and January of 2008 unemployment in the US averaged 4.5%. 1/2 the current rate. Twice that number of people are currently unemployed and the fact that the unemployment number will continue to rise is undisputed. There are no (zero) projections that the US unemployment rate will return to a 4.5% rate prior to 2017, a full 8 years from now. The current cause for “economic optimism”? Two banks reported “profits” at the end of the first quarter. What do the bank’s financial numbers mean? Where did the profits come from? Who really knows? Both “banks” received Billions in bailout funds that have not been repaid. Despite promises of “transparency” the Government’s Stress tests formulas are a secret and the “formula” applied changes from bank to bank. The “stress test” results are also being kept secret. Who passed? Who failed? Who knows? What transparency! The recent “mark to market” accounting changes are a sham. There is no way for the public to know exactly what a banks exposure to toxic mortgages are, nor can the public determine how the bank is evaluting those assets or exposures. Isn’t this is exactly how we got into this mess in the first place, financial institutions overstating the value of their investments in Mortgage backed securities? The recent accounting changes allow banks to evaluate the same piece of property differently, depending on how the bank chooses to classify the property. If a property or asset is to be put up for sale in the near future, the expected sale price is to be used. If the property is to be held for a longer period of time, the anticipated value at the time of sale can be used. How can the public discern whether a piece of property or asset currently valued at $1,000,000, doesn’t in fact have a “real” current value of $10,000. The bank, when it cannot sell the property for $1 Million, simply changes the “asset classification” to a long term hold rather than calling the property what it is, an overvalued piece of realestate with a $1 Million asking price and a current $10,000 value. Is TALF responsible for the Bank’s stated profits, profits made at taxpayer expense? Who knows? http://www.businessinsider.com/how-banks-and-hedge-funds-will-scam-the-talf-2009-3 Are these profits a sign of economic improvement or a sign of the fleecing of America? Had the Government allowed this sham, the change in accounting practices, months ago, the Financial Institutions bailout would not have been necessary. Nothing has changed in terms of the availability of “zero down” mortgages or the “Liar” or “Ninja” loans. The actions of Congress and the Boston Federal Reserve still stand, nothing has been repealed or revoked. Now those without a “down payment” can acquire their “down payment” through the use of a “second mortgage” where the “downpayment” is funded through a “second mortgage” or other “give away programs” intended to create the illusion that a purchaser has a “down payment”. http://www.mhdc.com/homes/down_payment_assistance/index.htm , http://www.ehow.com/how_4492950_through-zero-down-payment-loophole.html (An ACORN Scam), http://www.collinsdevelopment.com/home-buying/mortgage-down-payment.php . The “leveraging” in the US banking system remains unchanged. Certain US banks are still permitted to “leverage” up to 40%. http://www.startribune.com/business/41611927.html?elr=KArks:DCiU1OiP:DiiUiD3aPc:_Yyc:aUU The “dangers” of leveraging, another lesson that went “unlearned” from the “Great Depression”. The Government TALF Program even encourages the Hedge Funds and Banks to “leverage up” at taxpayer expense. http://www.businessinsider.com/how-banks-and-hedge-funds-will-scam-the-talf-2009-3 Do these Bank and Hedge Fund profits signal economic recovery or are they simply derived from looting “taxpayer” provided funds. Beware the “false recovery”. Many things can be learned from the 1938 “bounce” in the DJIA. One of those things is that the “1938 Bounce” did not signal an economic recovery. That recovery was 4 long years away. Signs of a pending economic recovery in 2009 are few and far between. Next to nothing has been done to prevent a repeat of the current crisis. The Government, Regulatory Agencies and Financial Institutions are busy cooking with the old recipe. Don’t delude yourself, when clear thinking is needed. The ship may be sinking at a slower rate, but the ship is still sinking. The time to call the orchestra on deck and dance has not arrived. It is time to man the buckets and bail like crazy. BEAR MARKET RALLY – Definition and Chart Examples: http://www.mysmp.com/stocks/bear-market-rally.html ; “After a move up of 20% to 35% off the bottom, the market begins to stall out”. How did the “stock market” fare during the Great Depression? In 6 of the 11+ years of the Great Depression the “Stock Market” closed up despite the fact that unemployment continued to rise, home foreclosures hit all time highs and thousands of businesses and farms were lost. The article then went on to say some very surprising things: “Nearly every sector in Asia charged higher, with carmakers like Toyota Motor Corp. and Nissan Motor Co. rallying on U.S. auto figures that were less dismal than feared.” Really, rallying on US auto figures – just what were those figures? Less dismal? They seem very dismal to me – after all you didn’t expect car sales to be zero did you? ‘Investors were encouraged after U.S. car sales jumped by nearly 25 percent last month from February, beating the typical rise and underpinning hopes of a turnaround in the American auto market — critical for Asia’s giant auto companies.’ What? Auto sales “jumped” by 25% last month – I don’t believe it, do you? (I don’t believe it for good reason – I know the real numbers). “A rebound in pending U.S. home sales in February from a record low, as well as improving manufacturing activity, added to a growing belief the most severe global downturn in decades may be moving close to a bottom.’ What? Housing sales are up? Where? By whose count? Manufacturing activity is up? By what measure and whose numbers? I’ll provide the unvarnished numbers shortly …..
“Still, the upbeat evidence distracted investors from more sobering news the U.S. private sector continued to shed hundreds of thousands of jobs last month — a worrisome sign as investors brace for Friday’s report on nationwide job cuts.” Yes, those pesky unemployment numbers – preliminary projects announced yesterday were absolutely awful – specifics to follow. Recession unfolds? Unfolds? One would think the recovery was underway based on the previous statements. This is beyond shoddy journalism, this is unethical reporting. My point is this, the data suggest we have not hit bottom, plain and simple. I’m looking forward to the “turn around” as much as the next person. I’m looking forward to it more than youmight guess. Unfortunately, that turnaround is expected to beging in 6 to 12 months and today’s data does not dignal an earlier start. Misrepresenting where we are at now can cost individuals a fortune with bad investment advise and can harm the recovery by setting false expectations that can only lead to disapointment. The truth is this; the economic elevator from hell that we are all riding, is still heading down. It’s descent may be slowing but there is no sign that it is about to stop. I’m glad to see that stock prices are rebounding from their 12 year lows, but as unemployment continues to grow and as the prosepcts for profits and dividends remain bleak, there is more than a possibility that these gains will be surrendered and that the markets will test new all time lows. Spending, taxes and the possibility of runaway inflation remain serious concerns. Wildly incorrect headlines maybe spurring people to re-enter the markets prematurely. Without a return to broad based profitability and dividend payments increased stock prices may not hold. Beware a “Bear Market Bounce” and don’t confuse “trading activity” with “investment activity”. Good Luck and lets hope for the best. Hope aside – here are the unvarnished numbers. US Auto sales are down, horrifically down. The report above so badly misrepresents the true state of auto sales in the US, I have to question the author’s ethics. The numbers simply don’t support, in anyway, the statement made above. The statement above can actually be harmful. If one were to believe auto sales were on there way back, one might fight necessary change to correct “broken business models”. What do the numbers show? Sales of new cars and trucks are down 36.8% in March 2009 compared to March 2008. Current sales figures indicate 1,000,000 fewer cars will be sold in the US in 2009 than last year and last year was one of the worst years in memory. http://www.boston.com/business/articles/2008/04/01/us_auto_sales_fall_in_march/ Continued sales reductions mean continued cutbacks, not growth , new jobs or new auto plants. Remember 1 year ago, March 2008, GM sales figures were down 19% compared to March 2007, Ford’s sales were down 14% over March 2007. http://articles.latimes.com/2008/apr/02/business/fi-carsales2 Chryslers sales were down 21.2% in March 2008 from March 2007. http://www.autoobserver.com/2008/03/march-car-sales-down-j-d-power-report-says.html . Having a year in which year to prior year sales drop 40%, after a nearly 20% drop in the prior year, is horrific. There has been zero increase in auto sales – not a 25% increase – net auto sales are down 40%. The March 2009 sales drop is twice as large as the sales drop in 2008. You may be asking, what did they base these incredible claims of increased car sales on – it is this – car sales increased from February to March. The fact is Car sales always increase from February to March. Car sales last year, one of the worst years for car sales in memory, still reflected an increased number of cars sold between February and March. The important or meaningful comparison is March 2008 to March 2009 sales numbers. By that measurement sales are down by almost 40%. As to car sales, the economic elevator has not even begun to slow, it is still acelerating. To misrepresent this number does a disservice to everyone. To claim that the data presents a picture of a recovering car market is false. Year to year sales are down 40%. In 2008 when sales were down 1/2 that amount the press described the drop as “falling of a cliff”. Now that the sales drop is twice that large, it is being reported as signs of a turnaround. GM’s sale decrease between January 2008 and Jaunuary 2009 was 49%. http://www.thetorquereport.com/2009/02/gm_sales_plunge_49_percent_for.html GM’s auto sales in February 2009 were down 53.1% from February 2008. http://www.mlive.com/business/index.ssf/2009/03/auto_sales_continued_slide_gm.html These numbers are simply horrible. To suggest this paints a picture of a “recovery” or “turnaround” is dishonest. Last year (March 2008) existing home sales fell 19.1%. The median home price was $200,700, down 7.7% from March 2007. http://www.realtor.org/press_room/news_releases/2008/04/existing_home_sales_slip_in_march March 2009 home sales have declined 8.6% from last year. http://www.realestateabc.com/outlook.htm The median price of a home today is $170,3000. So despite a drop in price (Value) of the medican home by $30,000,(17%) sales continue to decline year to year. The percentage decrease is smaller this year, but I’m not sure that is a signal that the elevator is slowing. As mortgage defaults or forelcosures continue and as unemployment numbers continue to worsen, I don’t know that a housing recovery can be predicted. What doesn’t need to be predicted, it can be stated, Home Sales did not incease as reported, they decreased again, from March 2008 to March 2009. The decrease was by 8.6%. Home sales were said to be at “crisis” levels in March 2008 and we have a further reduction so far this year. 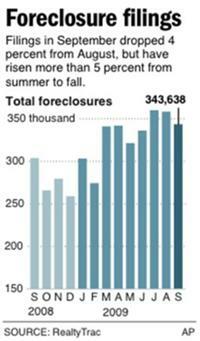 While there is no need to panic, these numbers so no signs of a pending recovery. Claiming that home sales increased is a simple lie. The are down by 8.6%. National Economic Update: “Recently released data indicate that the economic contraction has intensified at a pace associated with severe recessions. Two consecutive quarters of negative real growth, striking job losses and deep declines in both manufacturing and services output defined year-end 2008. While the economic outlook remains bleak for the first half of 2009, a few indicators suggest that the pace of contraction may slow in coming months.” http://dallasfed.org/research/update-us/2009/0901.cfm The rate of contraction “maybe” slowing in the months ahead – not that the descent on the economic elevator to hell is slowing at this time. The datum does not suggest the recovery has started, but the descent into hell maybe slowing. We are still descending, but not as quickly. Lets hope the policies being implement are the correct ones and we don’t suddenly accelerate into oblivion. I, for one, doubt that we can spend our way out of recession or borrow our way out of debt. Is The Worst Over? Economic Recovery? The Unvarnished Numbers Tell The Story. The article then went on to say some very surprising things: “Nearly every sector in Asia charged higher, with carmakers like Toyota Motor Corp. and Nissan Motor Co. rallying on U.S. auto figures that were less dismal than feared.” Really, rallying on US auto figures – just what were those figures? “A rebound in pending U.S. home sales in February from a record low, as well as improving manufacturing activity, added to a growing belief the most severe global downturn in decades may be moving close to a bottom.’ What? Housing sales are up? Where? By whose count? Manufacturing activity is up? By what measure and whose numbers. I’ll provide the unvarnished numbers shortly …..
“Still, the upbeat evidence distracted investors from more sobering news the U.S. private sector continued to shed hundreds of thousands of jobs last month — a worrisome sign as investors brace for Friday’s report on nationwide job cuts.” Yes, those pesky unemployment numbers – preliminary projections announced yesterday were absolutely awful – the specifics to follow. My point is this, the data suggest we have not hit bottom, plain and simple. I’m looking forward to the turn around as much as the next person. That turnaround is expected to beging in 6 to 12 months. Misrepresenting where we are at now can cost individuals a fortune with bad investment advice and can harm the recovery by setting false expectations that can only lead to disapointment. The truth is this; the economic elevator from hell, that we are all riding, is still heading down. It’s descent may be slowing but there is no sign that it is about to stop. US Auto sales are down, horrifically down. The report above so badly misrepresents the true state of auto sales in the US, I have to question the author’s ethics. The numbers simply don’t support, in anyway, the statement made above. The statement above can actually be harmful. If one were to believe auto sales were on there way back, one might fight necessary change to “broken business models”. What do the numbers show? Having a year in which year to prior year sales drop 40%, after a nearly 20% drop in the prior year, is horrific. Last year (March 2008) existing home sales fell 19.1%. The median home price was $200,700, down 7.7% from March 2007. http://www.realtor.org/press_room/news_releases/2008/04/existing_home_sales_slip_in_march March 2009 home sales have declined 8.6% from last year. http://www.realestateabc.com/outlook.htm The median price of a home today is $170,3000. So despite a drop in price (Value) of the medican home by $30,000,(17%) sales continue to decline year to year. The percentage decrease is smaller this year, but I’m not sure that is a signal that the elevator is slowing. As mortgage defaults or forelcosures continue and as unemployment numbers continue to worsen, I don’t know that a housing recovery can be predicted. What doesn’t need to be predicted, it can be stated, Home Sales did not incease, they decreased again, from March 2008 to March 2009. The decrease was by 8.6%. Home sales were said to be at “crisis” levels in March 2008 and we have a further reduction so far this year. While there is no need to panic, these numbers so no signs of a pending recovery. The unemployemnt rate has risen from 7.6% in January 2009 http://www.bls.gov/opub/ted/2009/feb/wk2/art02.htm to what might be 9% at the end of March 2009, an increase of 1.4% in 90 days. The unemployment rate increased 2.7% (from 4.9% January to 7.6% in December) in all of 2008. Just how low can stocks go? Despite Friday’s small gain, the Dow Jones Industrial Average marked its fourth consecutive week of losses as it tumbled through the 7000-point mark and spiraled to new 12-year lows. The Standard & Poor’s 500-stock index is trading below 700 for the first time since 1996. As earnings estimates are ratcheted down and hopes for a quick economic fix fade, the once-inconceivable notion of returning to Dow 5000 or S&P 500 at 500 looks a little less far-fetched. Futures activity suggested that stocks would slide at the open on Monday after four straight weeks of losses that have pushed major market indexes to 12-year lows. About 15 minutes before the start of trading in New York, futures on the Dow Jones Industrial Average were lower by about 132 points. S&P 50 futures were down by more than 13 points; Nasdaq futures were down more than 15 points. Changes in futures don’t always accurately predict early market moves after the opening bell. The pressure on U.S. futures came amid another cascade of selling in markets overseas. In Asia, Japan’s Nikkei 225 dropped 1.2% to a 26-year low after data showed that the highly export-dependent nation ran a current-account deficit in January, its first in 13 years. Banking stocks also fell, with Shinsei Bank sliding by nearly 9%. The Nikkei is at less than a fifth of its all-time high of 38915.87. Stocks in China and Hong Kong also fell. The Shanghai Composite slid 3.6%. Markets in Europe were also weaker. The FTSE 100 was down 1.5% after the British government’s confirmation that it was taking a majority stake in Lloyds Banking Group in exchange for its insuring potentially more than $367 billion of shaky assets. U.S. shares of Lloyds were down more than 9%. The shares of HSBC Holdings, another troubled British bank, were down 11%. Observers continued to express concern about the global economic outlook. Warren Buffett said in an interview on CNBC television that the economy has “fallen off a cliff.” The World Bank said the global economy is likely to shrink for the first time since World War II. Global industrial production by mid-2009 could be as much as 15% lower than 2008 levels, it said. S&P 500 futures fell 10.30 points and were below fair value, a formula to evaluate pricing taking into account interest rates, dividends and time to expiration on the contract. Dow Jones industrial average futures slid 121 points, and Nasdaq 100 futures shed 14.50 points. LONDON (AFP) – World stock markets fell sharply Monday as banking and economic woes returned to haunt investors, with Tokyo tumbling to a fresh 26-year low and London striking six-year depths. European equities plunged, with London reeling after the British government took a majority stake in Lloyds Banking Group (LBG) over the weekend in a deal to insure its toxic assets. The British capital’s FTSE 100 leading shares index slumped to 3,487.13 points in early deals, marking the lowest point since March 14, 2003. It later recovered slightly to 3,492.97 points, down 1.07 percent from Friday. Elsewhere, Frankfurt’s DAX shed 1.35 percent in value and in Paris the CAC 40 was down 1.77 percent. Most Asian markets sank after news of Japan‘s first current account deficit in more than a decade. Tokyo’s Nikkei-225 index shed 1.21 percent to end at 7,086.03, the lowest close since October 6, 1982. Hong Kong stocks dived 4.8 percent as shares in banking giant HSBC dropped dramatically, with investors spooked by the group’s US exposure and plans to raise fresh capital, dealers said. “The FTSE 100 fell … as the banking sector continued to weigh,” said Joshua Raymond, market strategist at spread-betting firm City Index. McAuleys World – Stop treating the symptoms and treat the problems.